Food, money, internet and more! The Inca Jungle trail is an adventurous and sporty trek to Machu Picchu. Undoubtedly, this trail has some advantages over the other 4-day treks. On the Inca Jungle Trail you have a great range of variety in activities: mountain biking, hiking and the option of rafting and a zip-line tour. Furthermore, the Inca Jungle trail is a little physically less demanding than the other trails. 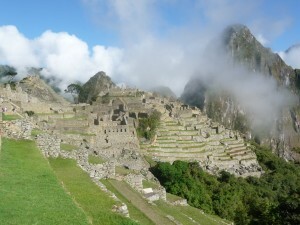 And finally, the Inca Jungle trail is cheaper than the other treks to Machu Picchu. In the morning we will pick you up from your hotel. The bus ride will take you through the beautiful Sacred Valley of the Incas. There you will arrive in San Luis, which is located at an altitude of 3200 meters. After a short briefing by your guide, it is time to start the trail. You will get mountain bikes and you will be provided with a helmet and gloves. When you are ready, the big adventure can start: you will bike down hill, through fascinating landscapes and you have the chance to see the typical Peru. After three hours of mountain biking we do a first stop in Alfa Mayo to have a small picnic. Here you have time to catch a breath and get new energy for the next part. The tour continues biking ups and downs to Huamanmarca, a recently discovered Inca site. Once you are there, the guide will explain you more about this site and the historical background of it. Then we continue to an altitude of only 1500 meters, where you will enter the so called high altitude jungle. This is a subtropical environment of coffee, tea and fruit plantations, close to the village of Santa Maria. You will have some free time to explore this area, before we will provide a typical Peruvian dinner. After this you will spend the night in a hostel – a budget family village. In the morning you will wake up and enjoy the great taste of the local coffee. After that, you start the hike along a gradually steeper path. After some time, we do a stop at a family restaurant. There you have time to relax, laze in hammocks, admire the coca plantations and take a drink while being entertained. 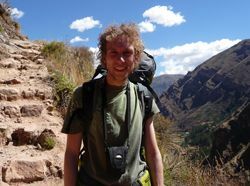 After this, we continue our walk and reach the traditional Inca Trail. After 2 hours of walking we will arrive in the city of Qellomayo, a small town where we have our lunch. From Qellomayo it is a short walk along the river Rio Vilcanota, until we reach the famous hot springs of Colcamayo. Here you can optionally enjoy the warm water and relax in a natural environment. From there it is only a short walk to Santa Teresa, where you will spend the night in a budget hostel. You will wake up and eat breakfast. Then we will walk to Colpani. During the walk you will have beautiful views and we will continue our way to the hydroelectric facility, where we will have lunch. From there it is only two and a half hours of walking on flat grounds to Aguas Calientes, the town at the foot of Machu Picchu. In Aguas Calientes you will have dinner in a local restaurant before going back to your hostel. Your hostel has hot water and a private bathroom. – South America´s highest Zip Line. About 15 minutes from Santa Teresa. Duration 1.5 hours. – Rafting near Santa Teresa. You are going to have breakfast very early in the morning. The last day of our trip starts with a climb up to the entrance to the famous Inca city of Machu Picchu, also called the ¨Lost City of the Incas¨. You will be one of the first visitors of the day. 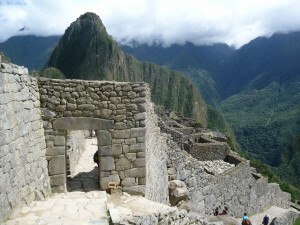 Your English speaking guide will take you on a tour through the extensive ruins of Machu Picchu. After your visit, you can walk back to Aguas Calientes for a lunch or enjoy the hot springs (not included). In the afternoon we take the train back to Ollantaytambo. From here you can get a bus back to Cusco. • Admission for Wayna Picchu or Mount Machu Picchu. If you want to book these additional options, please let us know. What do you need to take with you on the Inca Jungle trail? © 2019 Mundo Antiguo Spanish school. Calle Triunfo 374, int. 6 Cusco, Peru. Tel +51 (0)84 225974.